Shortly after Apple first revealed that Nintendo was bringing Super Mario Run to the iPhone and iPad, many users discovered that Cupertino was also using the game's highly anticipated release as a test run for a new "Notify" system in the App Store. Upon searching for the title on their devices before it was available, users were given the option of tapping an orange "Notify" button where the Get button or price usually appears. Undoubtedly many users tapped or clicked the button thinking they would be first to play Nintendo's debut title on iOS. But the delay between the game's appearance in the App Store and the actual delivery of notification prompts has left many users skeptical of the feature. 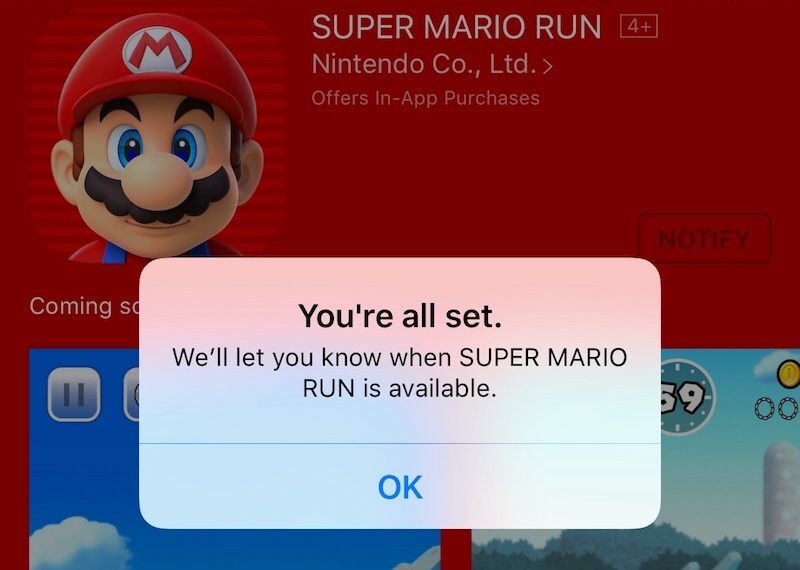 Scumbag Super Mario: Asks you a million times to be notified for the app release. For many, the notification came the day after the game had been officially released. Large numbers of people received it long after they had downloaded and purchased the full game. Others are apparently yet to receive the prompt they signed up to receive. It's possible that the sheer volume of users visiting the App Store in excitement for Super Mario Run caused a system-wide lag that prevented the notifications from being pushed to end-users' devices. If so, some may wonder why Apple chose to test the Notify service on such a hugely anticipated title in the first place. Conversely, Apple may have intentionally staggered the notifications to ease the load on its systems as gamers raced to download the app. In that case, the feature could prove a smart move on Apple's part for when big-name game publishers stoke up excitement for upcoming titles in the future. I think this feature is more for people that don't go to sites like Macrumors or other tech sites daily or even weekly. For those people, receiving an alert a few hours or a day or two after release won't matter. Who cares. So it was a day after it was released. Does it matter? Seriously though, if I ask to be notified about an event when it happens, it's not unreasonable to expect to be notified when it happens. Otherwise the 'feature' is not fulfilling its job, or it's substandard. I mean, you could argue the notify button is there for people who don't care when they get notified, as long as they do get a notification at some point. Fine, but obviously there's loads of people out there who DO want to know when something is available, so they probably feel let down by it. It's a slippery slope. Get complacent, accept shoddy services, say 'yeah whatever, it's just a game', but the next time Apple fails to notify you about something you REALLY DO care about or delays that notice for hours or even days, then what right do you have to complain? How do you establish a threshold of acceptance and reliability for a service which is consistently inconsistent? Amirite? Guarantee they were trying to keep their server healthy by not alerting everyone. Kind of like how they don't push out iOS updates with notifications at first. Steve Jobs would never have a delayed notification and I'm very concerned. I can't believe you have an expectation for quality games that are free. Ain't the way the world works, sonny. Bingo. Other than tech nerds most people don't care about this **** the way rumor sites portray it. I completed the game while waiting in line for Rogue One lol. The game is tooooooo short, btw. I'd say that's even a bigger negative than the always on internet connection.